In Excel you can use the Application.Speech.Speak method to convert a string to Speech. 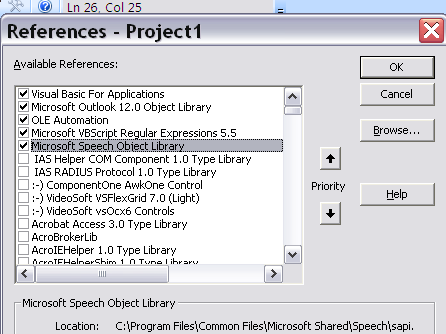 Here's how to use the Microsoft Speech API in VBA in Outlook, Word etc. Create a general procedure to use. In this case, A tagCloud in Outlook will say the tagCloud, as well as displaying it. For more tips like this, take a look at Get Started Snippets In the meantime why not join our forum, follow the blog or follow me on twitter to ensure you get updates when they are available. You can also submit anything you want considered for publication on this site to our forum. See A tagCloud in Outlook for an example of this function.